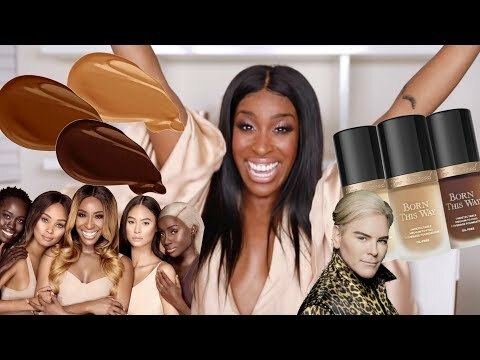 Jackie Aina, the outspoken Youtuber has worked tirelessly to build her beauty empire and now she adds the cherry on top of the cake in the form of a makeup collab that's a giant step forward for inclusivity in the beauty industry. Jackie's Too Faced 'Born This Way' foundation shades have finally arrived. For her 30th birthday in August of last year, the beauty blogger announced that she would be partnering with Too Faced to expand its Born This Way foundation line. In her announcement, Aina said the collaboration was a dream and explained the pair has been working tirelessly to "fill in the gaps." "Jackie has become a very good friend of mine, and I really respect that from the very beginning of her career, she’s been pushing for more inclusivity for deeper skin tones," Jerrod Blandino, Too Faced co-founder and chief creative officer, tells Glamour. "I was blown away at how dedicated Jackie was to making sure she got this all right. She interviewed dozens of people and reached out to hundreds of people online, and took note of what they needed and what they weren't happy with. She really did her research to ensure the nuances of every shade were perfect." A lot of people thought it was in retaliation to other brands, like Fenty, but we met about this way before we even knew what Fenty was launching. I absolutely understand that people felt like it’s too little too late. But this is a good thing. I see it firsthand when [brands] are just hopping on a bandwagon or trying to one up others. But I think there’s a difference between damage control and really actually caring [about being inclusive].